O wondrous and delightful brie! This super easy recipe is dominated with the salty and slightly pungent, creamy and gooey cheese delicacy known as brie. This cheese is so soft and sticky that it is guaranteed to stick to your fingers as you break it into pieces. 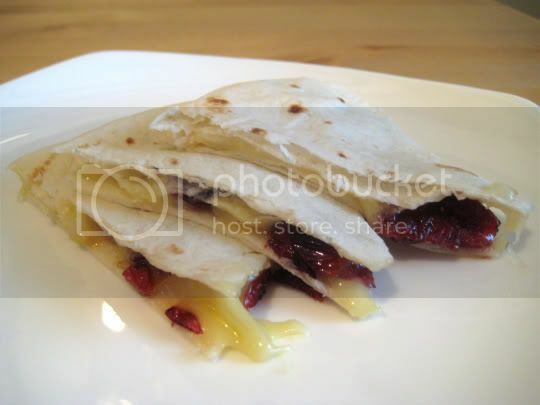 Sauteed (almost to the point of carmelization) onions add a wonderful savory flavor and sweet crunch, and sweet-tart dried cranberries bring the fruitiness that is the must-have combination with brie. Those three simple filling ingredients make this something worth preparing any time you want a quick gourmet snack. Placed between two flour tortillas and baked until the cheese is melty and fragrant, these quesadillas are cut into wedges and meant to be served right out of the oven. And believe me, you will want more than just one wedge, so have plenty of these on hand if entertaining. There are many possible adaptations to this recipe: Different fruits could be used (such as fresh raspberries, dried cherries or apricots, fresh pears or peaches, etc. ), and I think these quesadillas could make a complete meal served with a fresh salad of spicy arugula and herbs and a simple balsamic vinaigrette (or, you could even try adding the arugula in the quesadilla before baking). One last note, I would suggest cooking these in a pan (as in the typical quesadilla-cooking method) instead of baking in the oven. It adds a nice crunch and extra flavor to the tortillas. Make again? Definitely. I love brie!